Srila Prabhupada explained to us that we should chant the name of the entire Panca- tattva because of Their intimate connection. So when we are discussing Lord Nityananda, we are not discussing Lord Nityananda alone because Lord Nityananda is not alone. Lord Nityananda is always coming in the company of the Supreme Personality of Godhead. Whether Lord Nityananda is Balarama and Lord Caitanya is Krsna or whether They appear as Nitai and as Gauranga, that doesn’t matter. It is the same Lords who are appearing. It is said, like two moons simultaneously on the horizon of Gauda- “gauda doya pushpa danta” it is said that these two moons are now appearing, simultaneously. These are Gaura Nitai. And of course Advaita Acarya,and of course Gadhadhara Pandit and of course Srivasa Thakura. So like this, the sankirtan movement of Sri Caitanya Mahaprabhu became established in this world. Lord Nityananda is the ecstatic feature of the Lord because He is the servant of the Lord. When we begin to look at the tattva of Lord Nityananda, then we know that He is non-different from Lord Caitanya as Krsna and Balarama are non-different. They are the same, the same Supreme Lord because the Lord takes on unlimited forms. When He expands Himself into a form that is equally powerful to His own form, then we are speaking of the form of Lord Balarama. It is said, as so many lights can be lit from one candle. There is one original candle- that is Krsna- and so many expansions are there from Krsna. But Krsna, He is the original swayam bhagavan. But that same Lord, has appeared now. That is why Sri Caitanya Mahaprabhu is known as bhaka rupa, the form of the Lord who came as a devotee. And Lord Nityananda is known as nityananda-swarup, or bhakta-swarup, the one who comes in the original, the same form of the Lord- no difference. The only difference is that one is known as sevya bhagavan and the other is known as sevak bhagavan. Sevya bhagavan means the Lord that is being served and sevak bhagavan means the Lord who is in the mood of the servant. So the same Lord, but now in the mood of the servant of the Lord. ami caitanyera dasa muni, the servant of Sri Caitanya Mahaprabhu. In the course of serving Lord Caitanya, Lord Nityananda is experiencing great ecstasy, great happiness and Caitanya Caritamrta describes how the happiness of Lord Nityananda is so overwhelming and so intoxicating, that He becomes drunk- He’s drunk by that happiness! And one knows well that a drunk man cannot see clear. So in this case, Lord Nityananda doesn’t see clear. So who’s fallen, who’s not fallen- too complicated…give the mercy to everyone! Don’t select anymore. So it is Lord Nityananda who doesn’t select, who just gives the mercy regardless, due to His intoxicative state of ecstasy. And therefore Lord Nityananda is the most merciful and therefore Lord Nityananda is essential because you know, we can definitely have a competition. Not, ‘mirror mirror on the wall who is the most beautiful of all?’ but ‘…who is the most fallen of all?’ I mean, who is exempt? Who is exempt? Once we look behind the curtain and the next curtain and the curtains behind, finally we come to the raw reality- the raw reality of a fallen state. Who has not thought so many sinful things? Who has not done? Who can say that they are qualified? Who can say? So that is maybe okay and we can sort of brush it under the carpet. That is the way things are. But at the end of life, there is no more brushing under the carpet. Whatever was brushed under the carpet is still there and it all comes back. And then, whatever sinful activities, whatever offenses, whatever mistakes have been made will all be there suddenly staring at us, coming at us in all their ugliness and of course, leaving us in great fear and anxiety. How fortunate is one who has received the mercy of Lord Nityananda? Because that is the turning point, the turning point where a person will sin no more. Jagai and Madhai were most fallen. We will not get into the detail today but they were most fallen. But the turning point was ‘sin no more’ and then, everything was written off. Whatever happened before was not considered. That karma was written off! In the Caitanya Bhagavat we find descriptions of how Citra Gupta was the scribe of Yamaraja. He used to keep the records in written form of all the sinful activities of all the living beings. He didn’t know where to keep all the records! It was just too much! They filled up all the caves, they filled up every possible place and still there were more sinful records. That wasn’t all. There were messengers who were reporting the latest sinful activities of Jagai and Madhai and it’s said that those messengers were falling in exhaustion by the wayside. So Jagai and Madhai…it was pretty bad- undoubtedly, pretty bad! But, whatever may be. Then the miracle happened! When they got the mercy of Lord Nityananda and Lord Caitanya, at that point, all these records were to be destroyed and they just threw all of them in the ocean. And Yamaraja became ecstatic! Yamaraja fell unconscious in his chariot! I mean he was just beyond himself! His whole life, Yamaraja is dedicating himself out of compassion, out of shear compassion to rectify sinful living beings. Yamaraja is only taking on this ghastly role of punishing all these living beings for the sake of having mercy upon them so that they may become free from their wayward behaviour and eventually turn back to the Lord. And to see that, in an instant, everything was written off when it was so much! It was just overwhelming for Yamaraja who fell unconscious in his chariot. ‘my dear Lord, please forgive my mistakes because mistakes, everyone makes.’ We all say something and we think ‘I shouldn’t have said.’ Even Srila Prabhupada, at the end of his life begged pardon for having said things which were strong and said, “I beg forgiveness for all these things…” So one may pray, coming before Krsna, ‘Please forgive me for my mistakes and accept me.’ One who has chanted 16 rounds and followed 4 regulative principles…so simple! It is by the mercy of Lord Nityananda that it is all very simple. Vedic culture is not simple. It’s very complicated. Everything has to be right. ‘What direction are you facing?’ At different times of the day you have to be very careful because there are different directions: directions for sleeping, directions for bathing, directions for eating…you know what I’m saying? You need a compass or at least not a clouded sky! What do you do when there’s bad weather and you have no compass, no phone- nothing? When the hands get contaminated- wash them 12 times with clay! That’s a lot! You try- one time clay…wash it off. Two times clay- wash it off! Three times clay- wash it off! Only nine more times to go! So if I would even say the 12 times verbally that would be too much! ‘Oh forget it Maharaja!’ A quick rinse…clean! Very clean and nice. So that Vedic culture…Prabhupada told Pradyumna, his Sanskrit editor, who was into following Vedic culture, he said “if we strictly followed Vedic culture, then we’ll never get out of the bathroom!” So what to say…It is not possible, it is not possible. We are modern people of the modern age. We are not able to follow all that. We need a shortcut, a shortcut of mercy. We need it simplified and we need help because in this age of Kali….while we were in the Drakensburg I came up with this point that our birthright is weakness. It is inherent within us. Every resident of the age of Kali, no matter who he is, is weak, except a person who has descended from the spiritual world- Sukudeva Gosvami or Srila Prabhupada or such personalities. Otherwise, everyone is inherently weak. Oh yes, we pray. Praying is not a luxury. Praying is essential. But what’s the use if we pray with crocodile tears? ‘Oh yes, I am so sorry for all the thing I’ve done Krsna! Please forgive me, oh Krsna! And from this day on I will fully dedicate myself to You…’ and still we don’t! We don’t! I’ve said it so many times in my life. I said it the day that I shaved up and moved into the temple. I said, “Krsna from this day I am Yours.” It wasn’t true. It wasn’t! It was hypocrite. I’ve said it again and again. When I took sannyasa, I said is really serious. It wasn’t true! Every day, every day still, holding back. Oh I’m praying, praying to Lord Nityananda, “Please help me. Help me to overcome this inherent weakness.” This holding back out of foolish fear and not putting my faith in Krsna but foolishly holding on to put my faith in other things. Whatever it is, I’ll find something- anything, anything to stay busy. No time to chant Hare Krsna but time for computer games, which is like one of the most stupid things you could ever do. I’m sorry to say! Talk about wasting time. This is like the epitome of uselessness, like pointlessness, meaninglessness, absolutely wasting time. So, we are praying to Lord Nityananda to help us conquer that weakness so that we may surrender that part which we are holding back. And that part is there in all of us because that is the inherent weakness- the lack of full trust, that if we just cent per cent, give everything for Krsna, He will catch us and we will be in the best situation. ‘Yes everything is okay as long as I have my credit card. Yes it’s okay as long as I have my health insurance. 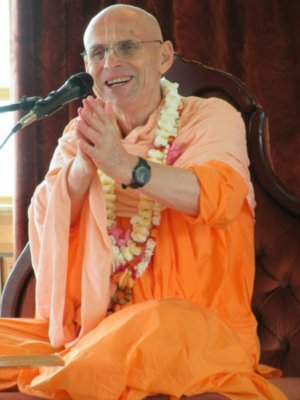 Yes it’s fine, I’ll surrender to Krsna as long as…’ But somehow or other, when we think of Srila Prabhupada, we remember that his spiritual master glorified him greatly for writing a poem for his vyasa puja. And in that poem there was one sentence which was highlighted by Srila Bhaktisiddhanta Sarasvati Thakura. It was “impersonal calamity thou has moved, absolute insentient thou has proved.” That English is a little bit classic; it’s somewhat archaic but basically, we can say “absolute insentient thou has proved” means that the Lord has a heart. That is at the very core of our movement- the heart. It is said that the devotee is always in the heart of the Lord and the Lord is always in the heart of His devotee. So this is the point. There is a loving exchange. So the compassion of Lord Nityananda is not an impersonal compassion- a sort of warm, wet blanket of lovey feeling for every living specie. No, it’s very personal. Lord Nityananda gives causeless mercy to those who don’t deserve and even then, if they don’t respond, He is still loving. But when they start to respond, His heart goes on fire! It’s not just some sort of flow- there’s a tap and it’s been opened, the compassion tap in the heart of Lord Nityananda and the mercy is flowing, flow, flow flow, mercy goes. No. It’s “impersonal calamity thou has moved, absolute insentient thou has proved.”Lord Nityananda has a heart and that heart is very deep. And the love in His heart is very deep. And he reciprocates with His devotee. As I said, first of all His mercy is causeless and has reached out to whoever is in His reach. But whoever responds is showered with unlimited, greater mercy and Lord Nityananda develops attachment to this devotee. The attachment that the Lord has…when the Lord has attachment to us, then you know how it is…when you are attached, then your vision is covered by emotion. You begin to see things through those feelings. You can no longer see things neutrally. You don’t see things neutrally. Lord Nityananda is not neutral. Lord Nityananda is overwhelmed by attachment to His devotees. No, it was to the devotees. It was attachment to devotees who have somehow or other done service and who are trying so hard, who are such nice people, who basically are just wonderful people. Lord Nityananda sees in that way, experiences in that way, very closely. So therefore we are living in an intimate relationship with Lord Nityananda when we are engaged in devotional service. Lord Nityananda is always engaged in devotional service. Lord Nityananda served the Lord in every possible way. First of all, He expands Himself and becomes maha visnu. So when He’s expanded Himself as maha visnu, He provides the entire material world basically. So He’s providing the material world. Then as Garbhodaksayi visnu He expands Himself again. He provides the universe. And as Ksirodaksayi visnu, He expands Himself and enters into the heart of every living being. So this is all Nityananda. Nityananda is providing the material world. At the same time Lord Balarama is also expanding Himself into Goloka Vrindavana. So He’s providing that energy. So that’s Nityananda basically. So He provides everything! He provides the spiritual world, He provides the material world…He’s provided every step basically. Then He becomes the personal seat of the Lord, He becomes all the utensils that the Lord is using, He becomes all the instruments- that is why we were taught not to put the kartals on the floor. The Lord is the kartals, harmoniums, mrdangas- it’s all the Lord! The shoes of the Lord- Lord Nityananda is those shoes. The brahmin thread of Lord Caitanya- Lord Nityananda took that form. Sesa naga took that (form). Lord Nityananda is sesa naga. It is said that sesa naga has thousands and thousands of hoods. Why does He have so many hoods? Because He’s a big snake? No, that’s not the issue. He’s the positiveness of all snakes. Usually we think of snakes as not so nice but He has taken this form because this form has unlimited hoods and each of these hoods have a mouth. And with each of these mouths He is glorifying the Lord. It is said in the Caitanya Bhagavata that the mouth of ananta sesa is the jewel case of the glorification of the Supreme Lord. And if you want to glorify Krsna, then one must pray to Lord Ananta and ultimately that is to Lord Nityananda. Okay that was good. Great! You did very well! Why is Krsna nice? (asks audience) quick, quick! Maharaja: Yes, why is Krsna nice? Maharaja: Okay, why is Krsna nice? Devotee kid: Because He loves the cows. There you go! Kids know the truth! It’s true. They do. So Lord Caitanya and Lord Nityananda are like that. They have all good qualities. And we should simply take it- glorify the qualities of the Lord. I won’t get into detail because the lecture is about Lord Nityananda and not about Vrindavana. But when Uddhava went to Vrindavana, although He was a loving devotee of the Lord- much greater love than we have- he was a great, great devotee! Who are we in comparison to Uddhava? But when Uddhava went to Vrindavana, he was an outsider. And when he returned from Vrindavana, he had been transformed. His visit to Vrindavana, was so powerful that he was never the same! Once Uddhava had been in Vrindavana, he was a new person. He was totally transformed. His whole horizon had been expanded, his love had been deepened and his humility had grown and he had developed deep love for the residents of Vrindavana and the greatest respect and you know…but Uddhava was still an outsider. Because it is only there that we get uplifted. Didn’t Narottama das Thakur sing, ‘nitai bine bhai radhe krsna paite nai’ that without the mercy of Lord Nityananda’s lotus feet, we cannot get to Radha and Krsna. We will remain outsiders. So therefore even here, in this Dur-ban, which is such a place, where Vrindavana is our meditation, even here we must know that the foundation of everything is Lord Nityananda. We must know. But to take it a step further. Not even in Dur-ban alone, but even in Vrnadavana, in the Krsna-Balarama mandir itself. Because Srila Prabhupada writes, in the purports in his Sri Caitanya Caritamrta, Adi Lila, he writes why he installed Krsna-Balarama in Vrindavana. And he explains that he installed Krsna and Balarama, who are the presiding deities. Why did he put Krsna and Balarama on the central altar? Why not Radha and Krsna? This mystery has been raised many times. Now, that question may not be answered in the purports and that is for everyone, personally to think about. But Srila Prabhupada said that he installed Krsna and Balarama because They are non-different from Gaura Nitai. So for me there is no doubt. That is why They’re on the central altar because Gaura Nitai are central at every step, at every step. Therefore, in Vrindavana, even right there we depend on Gaura Nitai. Now Gaura Nitai means chanting the Hare Krsna maha mantra everyday, kirtan, japa- the whole thing- Gaura Nitai. Nityananda Rama! Lord Caitanya sent Lord Nityananda to Bengal. Lord Caitanya, He could not go because He had taken sannyasa. He could not go back to His own village because that was not appropriate and appreciated. Nowadays we don’t care so much but at that time in Vedic culture that was not acceptable and one spot on the reputation of the sannyasi then people start to talk and lose faith. And faith is all a sannyasi has. We have no wealth but it’s faith- that people have faith in us- that’s our only possession, that’s our wealth, otherwise what do we have? Then we can take people to the Lord otherwise we are toothless tigers. Otherwise we cannot deliver the goods. Anyway, so Lord Caitanya was sent by His mother to Jagannatha Puri and subsequently He asked Lord Nityananda to go preach in Bengal. And what did Lord Nityananda do? Lord Nityananda started kirtan. He started ecstatic kirtan! And that kirtan was something! It was something, something, something! Because it is said that there were these whole group of young boys and they just got into the kirtan, as young boys sometimes do. And they really, really got into that kirtan, so much so that they didn’t stop. They couldn’t stop; they kept on going! They didn’t stop for prasad, they didn’t stop for nothing! They didn’t stop to drink! They just fasted and went on with the kirtan. And they became more and more ecstatic and more and more wild in this kirtan. They were wild kirtans! So they weren’t your sleepy (dramatic) ‘hare krsnaaaaa….’ but they were wild! They were lively! They were enthusiastic and everyone was dancing! And after one month of that kirtan- non- stop kirtan- the boys were just beyond themselves and they started ripping trees out of the ground! Okay we haven’t seen that here and it’s also not necessary. (Laughter) But that is what actually happened and the old men, they didn’t stand off to the side to watch it; the old men, they started jumping so high that they jumped into trees! And some jumped onto the branches and even the little branches and they didn’t break! Such was the kirtan of Lord Nityananda! People would disappear in that kirtan of Lord Nityananda and just get absorbed and never come back. Relatives would come look for them and they would also disappear in the kirtan. So many people of Bengal were in that kirtan! And the kirtan changed everybody! And Muslims were in the kirtan- beards and all! Moustaches and the whole thing! It was just absolutely amazing! Amazing! Lord Nityananda reached out to all! It was later, that through the mercy of Lord Caitanya and the six Gosvamis, standards were brought into the movement. In the beginning there were no standards. ‘Don’t worry about it just chant.’ As long as you were chanting then it was fine. But little by little, vaisnava standards also came via Vrindavana and then brought by Narottama and Srinivasa and Syamananda. And then it call came together- Vrindavana and Mayapur met and created the sankirtan movement of Lord Caitanya. So the mercy of Lord Nityananda is our foundation. It is on the strength of that foundation that we are here. It is only on the strength of that foundation of Lord Nityananda’s mercy that we are going to overcome our inherent weakness. We will always hold back, no matter what we say, no matter how much devotion we show. The nature of the resident of kali yuga is to be a miser. In kali yuga, everyone is a miser and we hold back in giving ourselves to Krsna. And therefore only Lord Nityananda’s mercy can help us. And that mercy is also especially available if we also take up the glorification of Krsna, take up the kirtan, take up the service of Krsna. Therefore the way to connect to Lord Nityananda, is especially through kirtan and chanting Hare Krsna and through devotional service. So that was the one hour that they kind of allotted for this lecture. Of course on a day like today I’m not worried and I’m stealing a little time. Stealing for the glorification of Krsna is not at all stealing. That is actually transcendental stealing and such stealing is nectarean. So if we can steal a few minutes, to say a few more words about the glorification of the Lord, that will be wonderful. But that requires your response. So if anyone has a question or a comment then that will be very nice because then our discussion would get a little more personal. So I’m hoping to get some response from your side. Devotee: Maharaja, to get the mercy of Lord Nityanada isn’t the spreading of this Hare Krsna movement also a part of getting the mercy? Maharaja: Yes, yes, yes, yes! Isn’t the spreading of the Hare Krsna movement also His mercy? Yes of course! The spreading of this mercy is the very nature of it. The Lord was loudly chanting, wherever He came, He was touching people and transforming people. Even people that were not interested became transformed. And then whether we chant directly or serve Hare Krsna.. Prabhupada said that one can chant the Hare Krsna maha mantra or one can serve the Hare Krsna maha mantra. Since this whole movement is known as the Hare Krsna movement because it is dedicated to the chanting of Hare Krsna. Therefore every service that we do is dedicated to that. Whether we are cooking, whether we are doing something on the internet preaching- whatever it is- if somehow or other we are increasing the glorification of Krsna, then yes, we are connected to the mercy of Lord Nityananda. This spirit of being a sankirtana devotee, of somehow or other always thinking about how to give others this mercy, then that can save us. If we think about ourselves and if we think about, ‘will I ever become a pure devotee?’ then if I start thinking about that, then how will I ever purify my heart and start to try and purify it. I don’t know where to begin to be honest! But when I’m thinking about giving the mercy to others, then there’s no end to that task. That task is just so overwhelmingly absorbing and there’s just so much to do, then I forget all about myself. And in the cause of that, then the material desires start disappearing and all kinds o impurities go away. So this is the wonderful thing of sankirtan, of becoming a sankirtan devotee. So yes, this is the one thing…the temple, yes we can be in Vrindavana, and in Dur-ban and relish being with Krsna. But then we turn around in the spirit of mercy and we must think, ‘How can I give this mercy to others?’ so many ways! Bring people here. Invite them. Simple! Bring prasadam to people. Bring books…bring! Somehow or other be a part of the sankirtana movement of Lord Nityananda which floods the entire world. That will transform us. And whatever is lacking in terms of personal qualities, then at the end, Lord Nityananda’s personal affection for that devotee, that will pull that devotee out of material existence without any difficulty. That will do it. So therefore with this lecture, as is with my nature, I wanted to be practical, I wanted it to be not just a nice talk about Lord Nityananda but I want it to be something that we can apply, that we can say ‘yes, let me do something with this in my spiritual life.’ Yes, we give these lectures one after another, they’re recorded, there’s a camera and we just don’t know how many opportunities we get to give such lectures and how many more opportunities there are for such lectures to be heard. So therefore, let them not go in vain like the blowing of the wind through the branches of the tree. Let it not just be sound and say, ‘nice entertainment on a festival,’ but let it be something that has some use in our life. That is my wish as a sannyasi who is meant to be a representative of Lord Nityananda. So in that spirit…that is my prayer. So I’m done. Thank you very much.